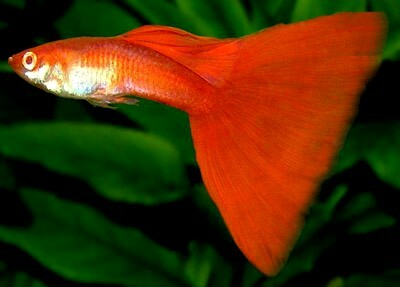 The process of setting up guppy fish aquarium can be divided into the following four aspects. In this post we will take up the first topic of cleaning of ornamental guppy fish aquarium and accessories for setting up the fish aquarium. In the subsequent posts you will find more information about the other topics. When you purchase the ornamental fish tank, request the store owner to check the tank for breakage and leakage. If that is not possible your first action on reaching home is to check the tank for leakage. Remove the packing used to protect the aquarium from breakage and scratches. Wipe the tank with cotton swap to remove greasy matter, if any. In the outdoors fill the tank with water by placing it on the thermocole sheet on a level ground. Do not move or lift the ornamental fish aquarium with water. Apart from being heavy, the bottom glue may give way due to direct weight of water on the joints. Check for leaks. Then clean the glass with plain water with glass scrub to remove dust on both the sides of the glass. warm water will help in removing grease and oil. Never use soap or detergents as the chemicals may hang on and poison the fish later. You can use dilute bleach to sterilize the tank if you want. If the tank is second hand, you must sterilize the tank with bleach. Rinse the tank thoroughly to remove the traces of bleach. Now place the stand at the predetermined place. Put the sheet of thermocole on the stand and place the empty tank on it. Wipe the tank glass clean with dry cotton or paper to remove water drops sticking on it. If the water drops are allowed to dry by themselves dust may deposit on them leaving marks. If you have purchased a hood clean it with dry clean cloth. Now you have to clean the gravel. Use only the gravel supplied by aquarium supply stores as it is more likely to be free from chemicals and harmful agents. Wash and rinse the gravel thoroughly as it may contain silt and dust; any laxity in this will leave your tank water cloudy and your sponge filter may clog. Rinse ornamental fixtures, ornamental artificial plants, if any, several times to remove dust and dirt (do not use soap or detergent). Not all types of rocks are suitable for fish. Some are really harmful to the fish. Only use the rocks purchased from aquarium supply stores. Wash the ornamental rocks with scrubber and rinse well. The scrubber and buckets must be exclusively used for the ornamental guppy fish aquarium. Wash the submersible parts of the air pump, filter, filter bed, tubing, thermometer and heater with clean water and wipe the electrical appliances with clean dry cloth after switching them off. Now you are ready for setting up the accessories and equipments inside the ornamental guppy fish aquarium.